Last week, the Mesothelioma Applied Research Foundation announced the recipients of its awards, to be presented during the Awards Dinner, on March 2, 2015, at the Hyatt Regency Bethesda, in conjunction with the organization’s annual International Symposium on Malignant Mesothelioma. Tickets to the Awards Dinner are available for purchase at curemeso.org/symposium. Recipients of the awards can be honored with the purchase of ads in the dinner program. More information is available at curemeso.org/adbook. 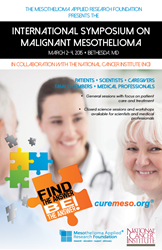 Last week, the Mesothelioma Applied Research Foundation (Meso Foundation) announced the recipients of its awards, which will be presented during the Awards Dinner, on March 2, 2015, at the Hyatt Regency Bethesda, in conjunction with the organization’s annual International Symposium on Malignant Mesothelioma. The awards are presented annually to individuals for their accomplishments in the fight against mesothelioma. In addition, an Outstanding Nurse Award will be determined through community voting on Friday, January 30. Registration for the Symposium is now open at curemeso.org/symposium, where attendees can also book their hotel rooms. A general schedule, a list of speakers, and further information about the conference can also be found on this page.